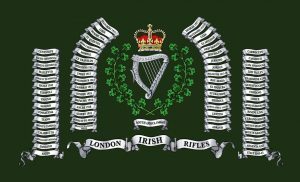 The London Irish Rifles was formed in 1859 and at that time was known as the 28th Middlesex (London Irish) Rifle Volunteer Corps. Numbered among the ranks of its first members were the Marquesses of Donegall and Conyngham, the Earls of Arran and Belmore, and also former Prime Minster, Lord Palmerston, who, at the age of 76, joined as a private soldier. Over the course of its history, the London Irish Rifles has gained 66 battle honours, during the Boer War and in both World Wars – probably the Regiment’s most famous battle honour was gained in September 1915 at the Battle of Loos, when men of the London Irish Rifles kicked a football into German trenches, thereafter entering immortality as ‘The Footballers of Loos’. This event is commemorated by the Regimental Association every year on Loos Sunday at Connaught House. HISTORIC EVENTS FROM 1859 TO THE CURRENT DAY. 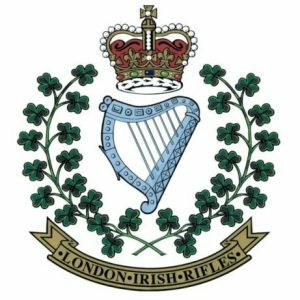 Read about the detailed Regimental history of the London Irish Rifles here. Read here about some of the momentous events in which the London Irish Rifles have taken part. The Battle Honours of the London Irish Rifles. “Festubert, 1915” “Loos” “Somme, 1916,’18” “Flers-Courcelette” “Morval” “Le Transloy” “Messines, 1917” “Ypres, 1917” “Langemarck, 1917” “Cambrai, 1917” “St Quentin” “Bapaume, 1918” “Ancre, 1918” “Albert, 1918” “Pursuit to Mons” “France and Flanders, 1915-18” “Doiran, 1917” “Macedonia, 1916-17” “Gaza” “El Mughar” “Nebi Samwil” “Jerusalem” “Jericho” “Jordan” “Palestine, 1917-18“. “Bou Arada” “El Hadjeba” “Stuka Farm” “Heidous” “North Africa, 1942-43” “Lentini” “Simeto Bridgehead” “Adrano” “Centuripe” “Salso Crossing” “Simeto Crossing” “Malletto” “Pursuit to Messina” “Sicily, 1943” “Termoli” “Trigno” “Sangro” “Fossacesia” “Teano” “Monte Camino” “Calabritto” “Garigliano Crossing” “Damiano” “Anzio” “Carroceto” “Cassino II” “Casa Sinagoga” “Liri Valley” “Trasimene Line” “Sanfatucchio” “Coriano” “Croce” “Senio Floodbank” “Rimini Line” “Ceriano Ridge” “Monte Spaduro” “Monte Grande” “Valli di Comacchio” “Argenta Gap” “Italy, 1943-45“. Over a thousand men from the London Irish Rifles are listed on the CWGC database from December 1914 to June 1919. The Second World War Roll of Honour of men, who died while serving with the London Irish Rifles from 1939 to 1945 can be found here. WE WILL REMEMBER THEM ALL. From March 1915 to November 1918, two Battalions of the London Irish Rifles gained 25 battle honours in actions across Northern France, Belgium, Greece, and the Middle East..
Click here for First World War stories and links. From November 1942 to May 1945, two Battalions of the London Irish Rifles gained 40 battle honours in actions throughout the Middle East, North Africa, Sicily and mainland Italy, before taking part in peace keeping duties in Northern Italy and Austria. We have added extensive details of the vital part played during these campaigns, including excerpts from the Regimental History, Rolls of Honour, and also links to war diaries, personal narratives, and citations for honours and awards of men who served with the 1st and 2nd Battalions of the London Irish Rifles during the Second World War. Click here for Second World War stories and links. Read the story of the reasons for the Regiment’s wearing of the Caubeen here.